This is a sketch book page (size A5) on Langton’s not (cold pressed) paper. It will be worked on in the studio to give a before and after. Easier to say this as No1 son has gone to see his grandparents for a few days, No2 is quietly teaching himself some computer code and someone else is cooking supper! Its turning out a better day than I thought. I have harvested the pears from the early tree and have started to pick both the Katy apples and the Owen Thomas. There is a Worcesterish flavour apple at the community orchard ripe too. Butterflies seem to be especially abundant this year and I have seen a Brimstone recently which is unusual, even rarer is the Fritillary has been flying strongly in the garden, we have dozens of Gatekeepers or are they Meadow browns? and a few Speckled Wood. A while back we were seeing Red Admirals and before that in June some tortoiseshells. Of course when I say abundant I do not mean in the sorts of numbers there were in London when I was a kid but relative to what I have seen here in Sussex in recent years. The most popular flower in the garden at the moment is the oregano which is covered in a busy haze of bees and bee imposters as well as the little brown and orange butterflies. An enormous Southern Hawker dragonfly was sitting on the spirea too one day. 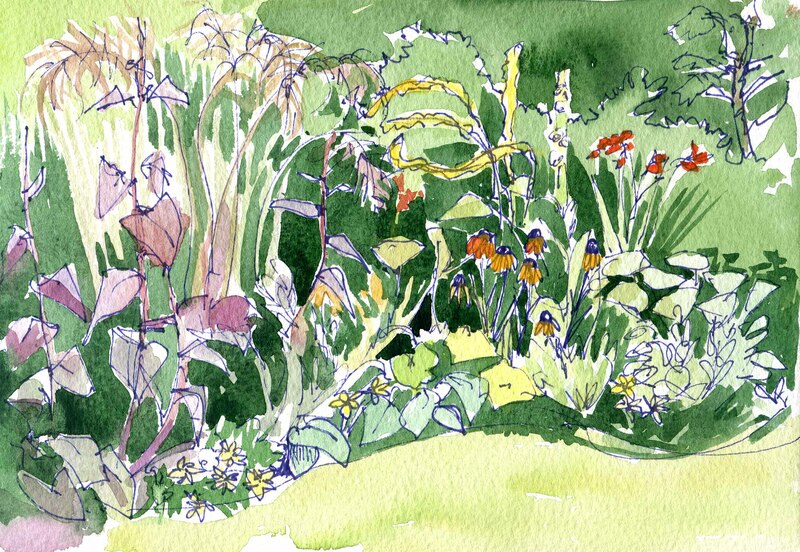 The hot border was at an NGS garden called the Hundred House near Framfield in Sussex. I am currently planning a day trip to Great Dixter to keep DIY dad away from his multiple projects for a day. The garden here has had a big change imposed on it- the tatty summer house has been taken down and a new roof is to be made for it…..and a proper base. Anyone thinking of spending good money on a shed should pay attention here , the base is as important as the shed itself and needs to keep the shed itself up and out of the mud which will lead to rot as night follows day. Any earth which is nearby at a higher level will slump towards your shed, any tree which has leaves to drop nearby will pile its leaves on the damp earth and wick moisture up to the thin wooden walls. Animals will move in underneath if they can and make a den or nest, solitary bees will find crevices in the walls or doors to make nests. All this has to be considered when placing a shed. Then there is the maintenance…..the roof, it follows, must always keep out the rain. Our best shed/summer house is in amazing if not perfect condition …it appears in a photo of my former neighbours taken in about 1960. It must be made from red cedar as I do not believe any other wood could last so long. 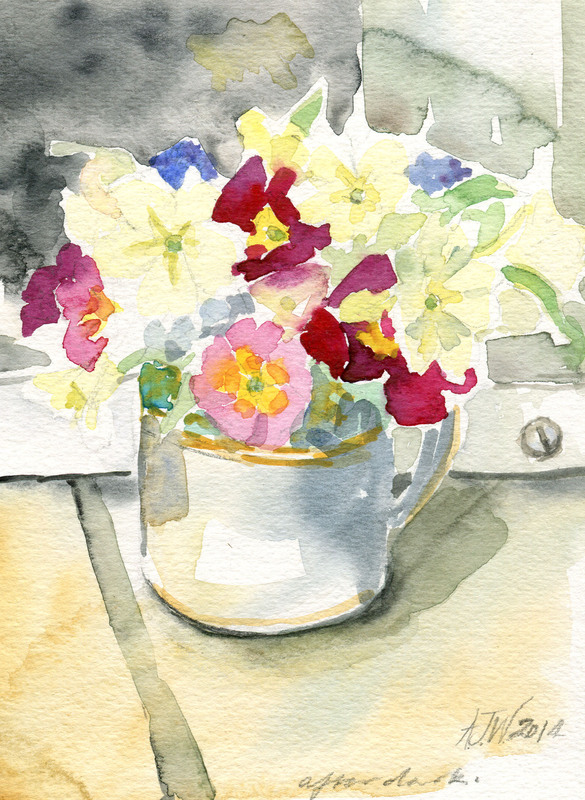 The flowers were in a vase and I was sketching them at the exhibition at Nymans but , being in rather a cramped corner I realised I had nearly flicked paint onto an art work of mine which I was trying to sell and I stopped painting!! 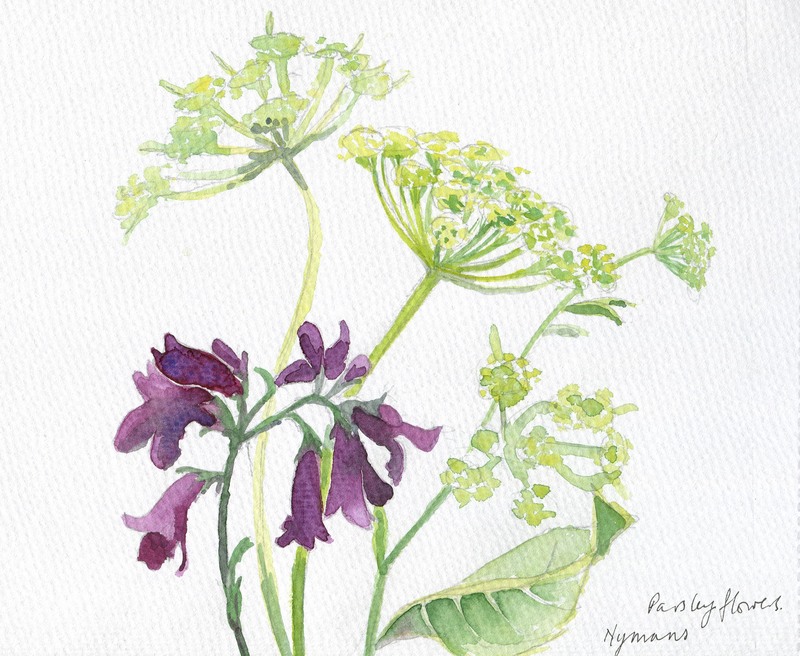 The flowers came from my garden and having picked the stars of the bunch: Penstemon and creamy white roses, I needed fill and had none until I noticed that the parsley had gone to seed and was a lovely yellowy green a bit like Alchemilla mollis. The shapes in the flowers are lovely too . I finished it off in the studio just now. There are things you want to buy when you live somewhere but don’t, things you buy and regret and then there are things you buy later because it would have been nice to have bought them at source. I read recently that we often buy things when in the throws of nostalgia. Afterwards you have to find somewhere to put them. We bought this carving in Sussex in the days when a reasonable middling income didn’t attract higher rate tax but still allowed one some disposable income (that is all reversed now). It was an impulse buy; having gone past our turning we turned round in a driveway and saw among other statues they were selling this carved Shona woman. We have a little one in the same stone inside called “Granny” which was bought in Africa…on impulse- we thought she was £20 but that had been the jet lag doing the calculation…..still no regrets, we love them both. This flower bed was pretty this year if a little sparse on the lavender…wonder that it survived that wet winter at all. I should take some precautionary cuttings to root and keep in drier conditions over winter. I will do the same for the cotton lavender and see if I can obtain the seeds for the perennial poppy in soft orange that was part of the original planting. 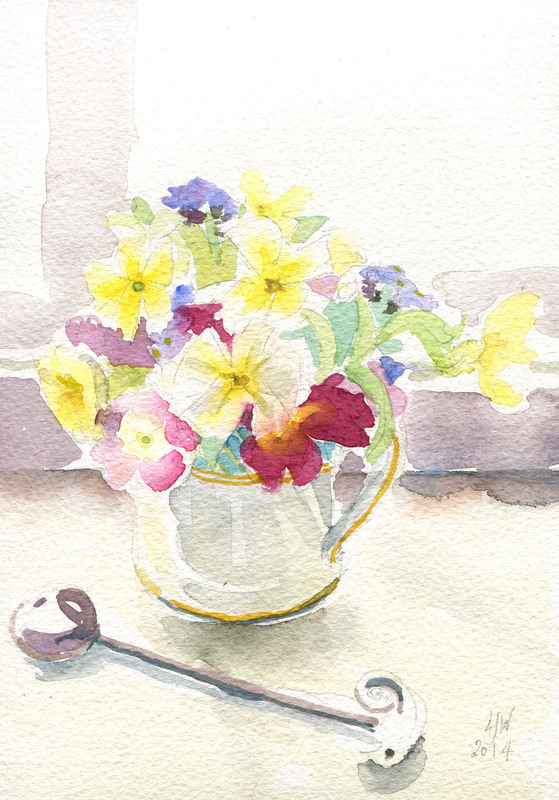 Compare with the same bed (June 2010 picture 85 or thereabouts) when I sketched it before-while England lost at football, some things don’t change much. 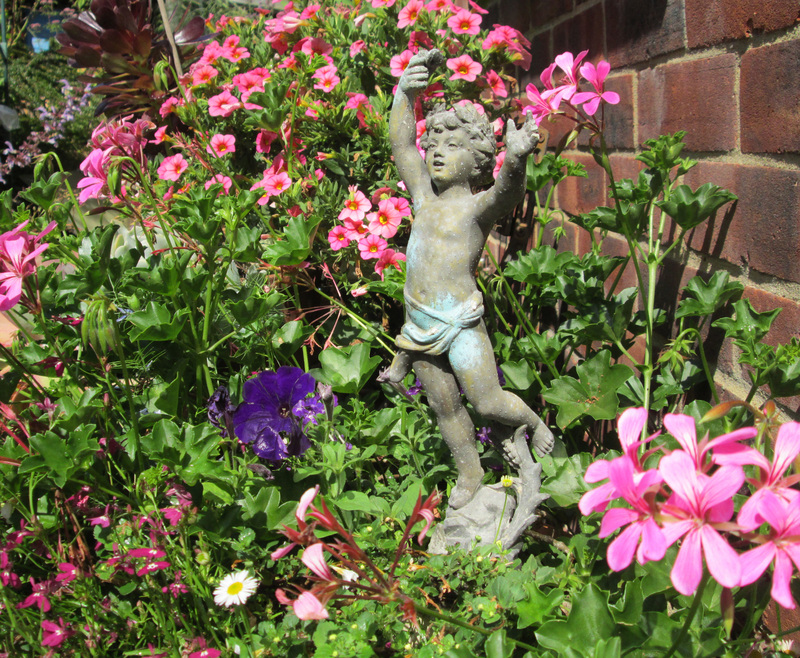 Just spent Sunday going to most of the open gardens in Burgess Hill we managed 6/8….they vary as much as the people who own them.I was very taken by climbing hardy fuchsia Lady Boothby; bright upper and smouldering lower parts on five foot ruby stems. One small garden had been subdivided about four times making an entrance, a main room, a dining pavilion, and a lounging room off the main, hidden behind the bijou opulent dining pavilion was a greenhouse and water feature…I felt ashamed at the emptiness of my beds only the backdoor pots can compete. The owners of several of the houses seemed to have a real knack of cramming personal references into their garden, they were as gloriously abundant as a Christmas display in Harrods or Selfridges. I am afraid I decorate sparsely – more like a string of token tinsel about the greengrocers vegetables in my case!! 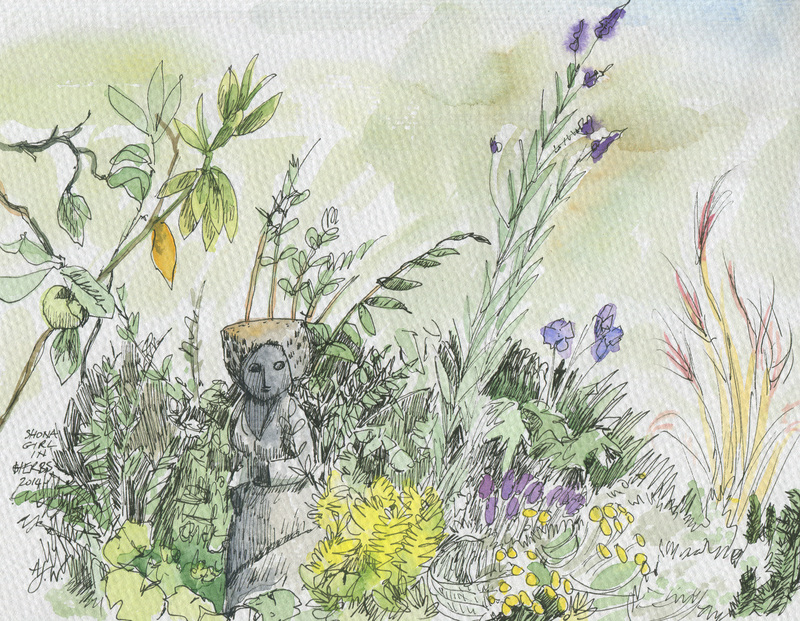 Actually I couldn’t garden that intensively as it would be too much work, what a treat to see other people do it well. I have however put the old broken cupids back in the pots by the back door (see above). The plants hide the broken bases, my grandmother forced these figures on me one day( “Here,have these you can patch them up!”), and, as I had not wanted them and they were badly broken, they sat in a box unloved and unused for at least twelve years. There was no chance of my mending them not having any handy machinery for cutting the green onyx or alabaster which had fallen off the plaster bases and where to get the hideous stone anyway? I like them waving or drowning in the annuals though. 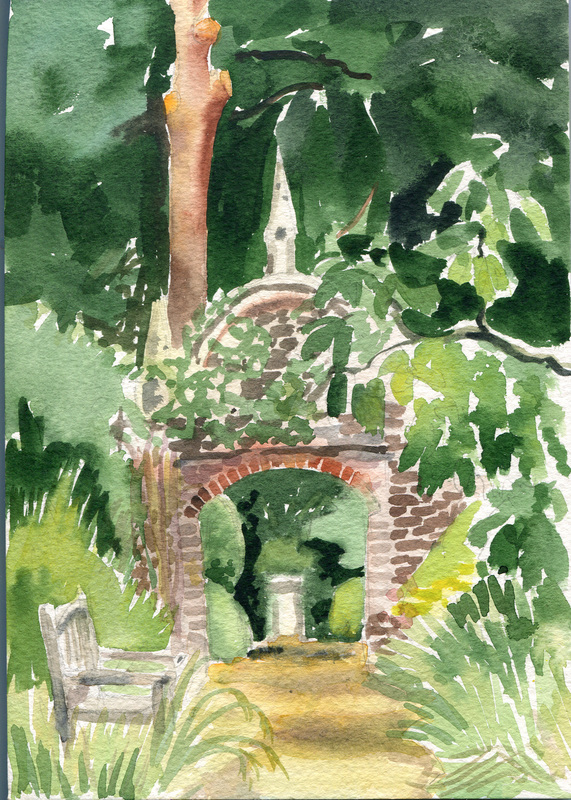 This is a watercolour sketch of one of the gates to the walled garden at Nymans a National Trust garden in Sussex UK.I was sat only 12 metres from the main path but on this side path it was quiet enough that a mouse or vole was carrying her litter of babies across the path one at a time to (presumably) a better home in the long grass to the right of the path. As I say it was very quiet until two German tourists noticed me and decided that the view must be worth a photo if I was sketching it- so he went and stood in front of the gate and she came and stood right in front of me until she had her shot, not a trace of an excuse me! So rude! The reason I went was because it was the sort of day when it was threatening rain and there was space in the car park. Due to the new charges at Wakehurst Place many people are going to Nymans instead. 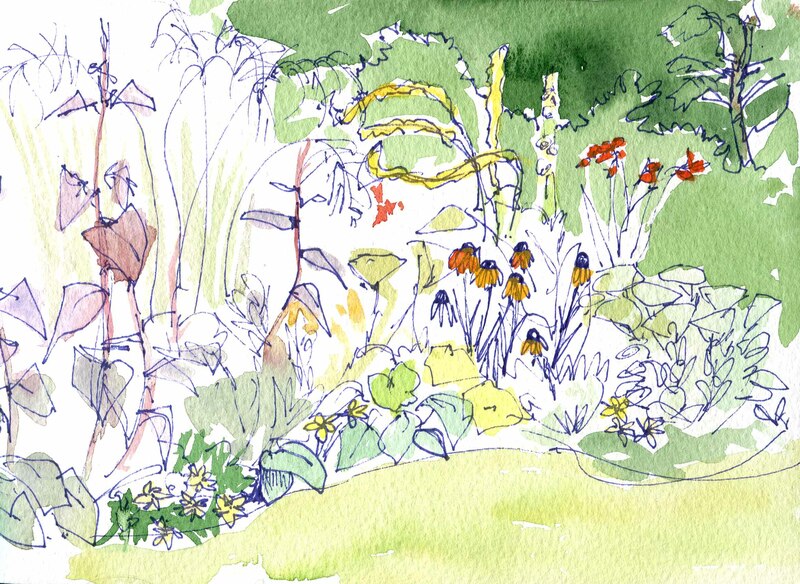 This is a shame as it is a much smaller garden with a more intimate scale and too many visitors would make it difficult to sit down and sketch or appreciate the garden so well. Going back to the sketch it has a schoolgirl error in it …can you see? I will need to do some work in the studio on it or make a copy; I also need to get some opaque paint to put in the cream roses growing over the gate….or do a copy. It has a nice feel however.